Respect Or Exploitation? | WELCOME TO THE P.L.F. Here’s an ad that was on the back page of TIME magazine. 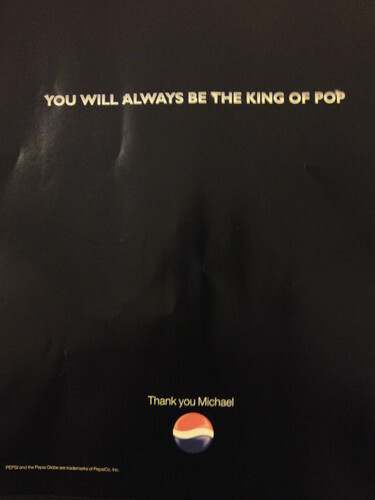 Is it a gesture of genuine love and sorrow or a desperate attempt to look like Pepsi are a brand that cares? “It’s the least they could do after trying to cremate him before he was even dead”. Very true … but what do you think? Is it good … bad … ego driven stunt or a total and utter waste of shareholder money? And is it us, or have they used the old Pepsi logo? We wouldn’t be surprised given Arnell’s updated creation features a smiling face which is hardly appropriate when talking about death. But then what would Pepsi know about appropriateness given they were happy to pay millions of dollars for an identity that is almost the same as their old one but with the Mona Lisa as ‘inspiration’. So come on, is this the King of Print or the King of Pap? You’re currently reading “Respect Or Exploitation?,” an entry on WELCOME TO THE P.L.F.